It has already been more than a year since Facebook Live was launched. The coming of live streaming doesn’t merely mean a new feature for celebrities or journalists to engage with their fans or followers. It actually creates an opportunity for people who desire to become influential and make an impact on their online community. As for traditional retailers, on the other hand, it means more than that. Despite the fact that most of their business doesn't catch up with the coming of digital age and most of them don’t even know how to manage fan pages well, the easy-to-use feature of Facebook Live is exactly what they desperately need to reconnect their business to picky customers, assisting themselves to get to the second summit in their career. Based on the way audience purchase their wanted items on Facebook Live, there are two types that become increasingly popular among online sellers: bidding system and direct purchase. Bidding system, as what it means literally, indicates audience can purchase items by winning the bid. Putting a bid, due to the inherent limitation on Facebook live video, is through making a comment with numbers representing their bid. Unprofessional as compared to real auction houses as it might be, it allows anyone to join the auction regardless of the social status and income level. More importantly, it evokes the audience’s memory, mostly older millennials, toward street auctioneers in traditional markets and night markets in early times. Direct purchase, on the other hand, means audience on live streaming can buy products at a fixed price without bidding. As features of products are lively and detailedly stated by the channel host, it further encourages the happening of impulse purchase[BB2] . More precisely, since some prospects might not be willing to join bidding process, this purchasing method provides them with an easier and faster access to make purchases. A mixed type of the both aforementioned is also widely adopted, depending on what kinds of product are being auctioned. Up to now, there is a great assortment of products presented in front of audience’s eyes. From fashion and beauty products in the early stage to the emergence of high-end furniture collection and luxury jewelry currently, almost everything can be sold through live streaming. Most notably, high-class seafood and meat, such as hairy crabs and Angus rib-eye steak, are becoming increasingly sought-after products catching the public’s attention. Broadly speaking, these products can be roughly classified into two categories based on profit margin. High-profit-margin products, premium designer handbags, for example, are sold mainly in the means of bidding. Surprisingly, these luxury goods awaiting auction are rarely ended with nobody bidding due to the fact that most products are auctioned at an extremely affordable price, rapidly attracting thousands of online viewers to join the bidding. Sometime, the audience can even ask for more additional bonus, such as free shipping and delicate packaging. Low-profit margin product, alternatively, is sold in the approach of direct purchase oftentimes. In fact, live streaming furnishes sellers with a brand new channel to engage the audience. More explicitly, the special and amazing interaction experience brought by live streaming is what traditional infomercials couldn't compete with. Live streaming a products' demo and unboxing is undoubtedly taken to another level and significantly augment purchasing enthusiasm. Within a short time, these live streaming sellers, usually ordinary and not famous, became the hottest star on social media platform, aggregating a huge number of loyal fans and followers in a blink of an eye. With the climate of live streaming forming an invincible momentum, several indispensable elements resulting in an impactful and successful live shopping campaign gradually become clear. Influencers, referring to online celebrities or experts in a certain field, play a paramount role in the live streaming process. Given the trust the public has in them and their positive and professional public image, their words carries enormous weight. On top of that, their fame and popularity allow product sellers to reach a very large audience across online community, creating a striking synergy that contributes to a successful live streaming propaganda. On the contrary, suppose product sellers need to host campaign alone and be the mainstay because of limited budget, creating an appealing and vibrant interaction is the key to triumph. One of the most compelling examples is the reappearance of street auction; this time, however, it appears on the stage of Facebook Live. Traditional street auctioneers, with their hilarious way to entertain audience and dumbfounding skill of speech, catch the waves at a perfect timing and meet their long-awaited career peak, resurrecting the long-lost street auction. Exclusive giveaways and limited-time offer, widely carried out in sales strategies, are another common but integral element. By doing so, it not only relatively accelerates the process of live streaming, since audience is not patient usually, but also significantly decrease time spent on thinking whether buy or not, giving rise to the conception of “I’ll kick myself later if I don’t buy it now”. Simple and straightforward as the element is, the outcome is exceptionally fantastic sometimes. The exclusive and limited-time offer is exactly a perfect illustration. Last but not the least is the arrangement of sleeping cells, who remain active during the entire campaign and pretend to be an enthusiastic audience. Outstanding and impressive as some of the live streaming performances are, the majority of campaign results don’t come out as strikingly and prominently as planed. Most streaming viewers are passive, timid, and are inclined not to be the first one putting in a bid or starting conversation. Consequently, such an arrangement of spies, sleeping cells, that infiltrate into audience can effectively invigorate the beginning of live streaming and avoid occasional awkward silence. In fact, the rise of live streaming shopping comes with some reasons, physical cost reduction being one of the most decisive factors. Owing to the inherent advantage of live streaming, online sellers are able to do live streaming with their smartphone camera almost everywhere as long as there is access to the internet. Moreover, this advantage of convenience greatly reduces the entry barrier for the traditional physical store owners, who merely focus on offline sales only, to show up their online presence and create their own online community with a click on the live button. Some even claim preparation for everyday business hour in the physical store seems redundant and taking much effort but gaining little avail in terms of profit. 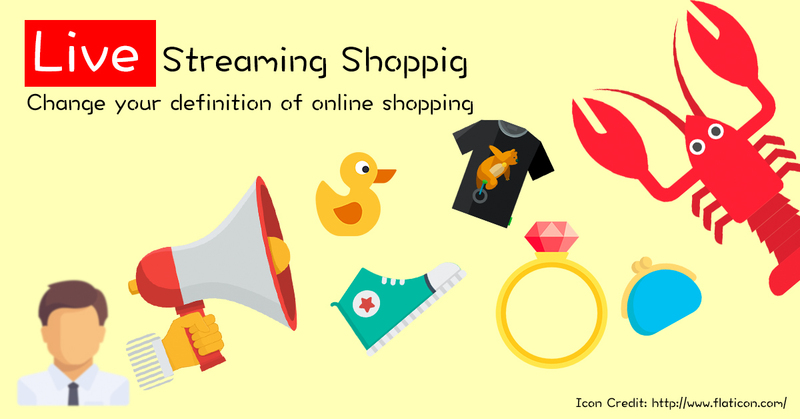 Furthermore, the real-time online interaction between sellers and viewers is another benefit of adopting live streaming in shopping. In contrast to most recorded product video clips that are static and unable to make changes in response to viewer’s reaction swiftly, the audience-oriented feature of real-time online interaction gives more flexibility to make adjustments to meet viewers' ever-changing and diversified taste and creates an unprecedented entertainment experience. More specifically, this advantage just exactly makes up for what it lacks in the regular ads videos and infomercial. Finally yet importantly, leveraging live streaming well, especially on Facebook, gives followers a better understanding of seller’s business, helps build customer loyalty, and demonstrate seller’s unique value proposition. It is also reported that viewers spend more time on Facebook Live than any other type of Facebook content. Despite the fact that not every viewer would buy products showcased, they may someday make their first purchase ultimately and become loyal fans as long as sellers stay creatives and appealing in running live streaming campaign. Perhaps, “15 minutes of fame” will come true soon and extended to even longer times. “It’s unbelievable that our sales revenue has almost doubled since the use of Facebook Live,” said a toy retailer in the interview, chuckling to himself. “Live streaming is such a powerful platform that I’m even considering shut down my physical store and focus on Live streaming auction.“ He continued to share that the biggest reason why he loves Facebook Live so much is that there exists no temporal and spatial restriction. While the use of live streaming in selling product seems flawless, there actually exist issues regarding tax, fraudulence and potential shopping dispute. Tax evasion is one of the frequently reported issues. Thanks to the lack of payment gateway on Facebook Live and the fact that most transactions are carried out behind the scene, conducting a tax investigation become a thorny problem to handle for taxation bureau. In addition, the incomplete regulatory system leaves a gray area for people with a bad intention to seize the opportunity to take advantage on. Even until now, the administrative unit has not come up with a better solution and can only solely rely on taxpayer volunteering to file tax returns to levy the necessary tax. Fraudulence, similarly, appears in live streaming shopping occasionally. The emergence of knockoff and counterfeit, luxury items, in particular, shows now signs of stopping due to tempting profit margins and advanced and mature manufacturing techniques that make unauthorized products look extremely genuine. Customers may fall into the trick easily when coming across the fake product on auction at an irresistible price. Most importantly, buyers don’t realize the ugly and appalling truth until the deception is disclosed. Apart from Facebook Live, there are two other local live streaming platforms, LIVEhouse and Funoo, that are popular in Taiwan and are targeting different segments of client respectively. LIVEhouse, founded in 2013, is the biggest local live streaming platform in terms of scale. Special Services, including studios rental with filming equipment and consultation on content planning with support from groups of professional, are exclusively served for clients, based on their official website. Currently, they tried to expand their presence in the live auction by cooperating with one of the most famous jewelry appraisers, A Bang Shih, in Taiwan. Even though the performance was not revealed, their ambition toward live streaming shopping is obvious. Funoo, another Taiwan-based live streaming platform, was officially launched in this April. In comparison with Facebook Live and LIVEhouse, Funoo is the first platform aiming for providing one-stop service for clients by integrating payment gateway, logistical system, and other necessary services. So far, they have built a partnership with several large corporations, actively holding public lectures to build brand awareness. While the development of live streaming shopping moves forward at an ever-increasing pace, the entire industry is still fragmented and under formation. We are not sure whether it is just a short-term fad or a revolutionary progress or not. But, live streaming shopping will undoubtedly spark another fierce battle in retailing.